During our recent trip to London we visited The Science Museum. This museum is full of cool, interactive exhibits and with the girls being aged 7 and 10, they were the perfect age to visit. We caught the tube from our hotel, the Hilton London Metropole, to South Kensington and we arrived before the 10am opening which I would recommend as the queues quickly built up behind us. This huge museum is located on Exhibition Road, South Kensington. On one side is the National History Museum and the other is the V&A. Entry to the Science Museum is free, although a donation is suggested. As we entered the museum the kids made a beeline for the top floor where the incredible Wonderlab is located. We had heard good things about this permanent exhibit before we visited and I can see why – there was so much here to keep both adults and kids occupied. 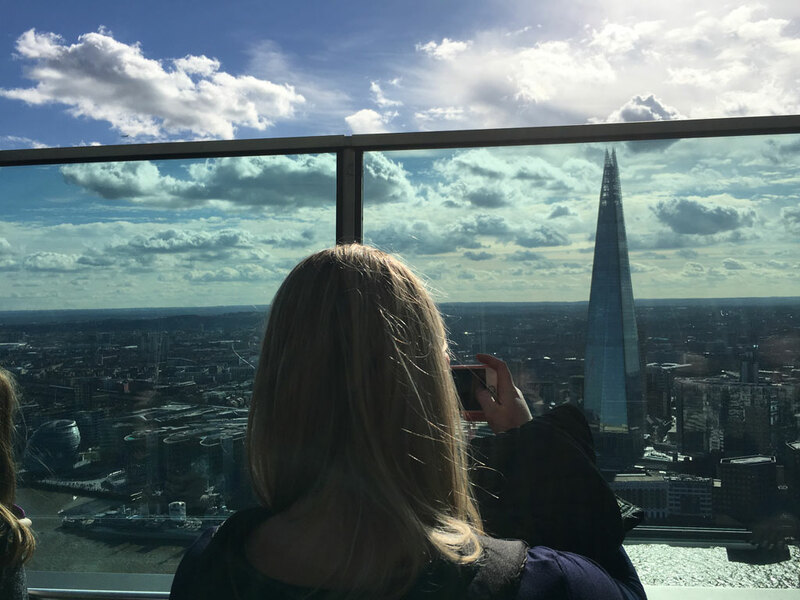 In fact it is one of the best things you can do in London with the kids – they will love it. Tip: take advantage of the cloakroom facilities as you enter the museum where you can leave your coats and bags. If you could imagine the best hands-on, interactive, educational playground then it will be Wonderlab. We had shown the girls Wonderlab before our visit but nothing can prepare you for just how good this area of the Science Museum is. We loved watching the girls’ faces light up with curiosity and by hands on learning it was teaching them about science and maths through self-guided exploring. If you arrive early like we did, I would recommend you visit the friction slides first as queues build up quite quickly here as it’s the most popular area of the exhibition for good reason. The way that the museum has incorporated learning and play is brilliant, especially at the giant friction slides. 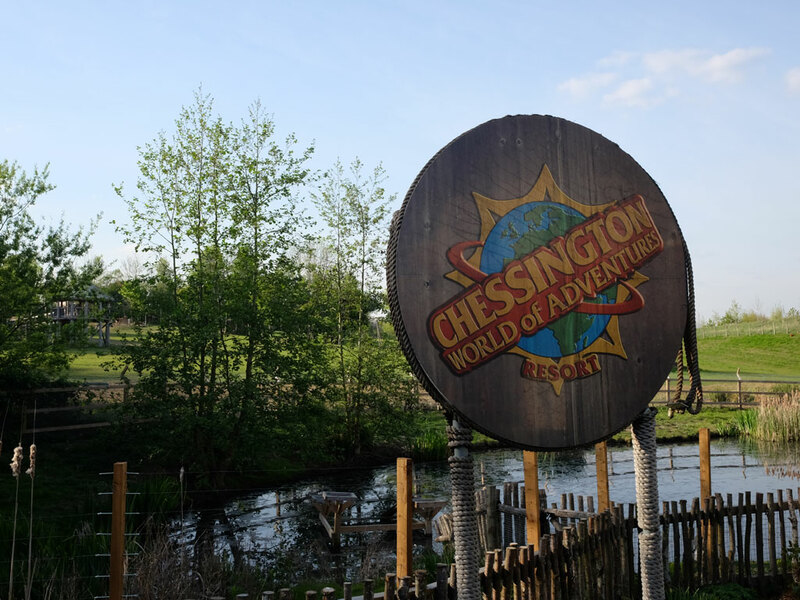 Chloe and Holly loved this – as they whizzed down each of the three slides, which were made out of different materials (artificial grass, plastic and wood) in their hemp sack they were learning which slide would be the fastest based on friction. There are seven themed zones here at Wonderlab: Maths, Electricity, Forces, Space, Light, Matter and Sound which help children (and adults) look at how science and maths are involved in our everyday lives. There are over 50 interactive exhibits here to enjoy – we wandered around a giant model of the Solar system, watched how water freezes under a giant magnifying glass, watched a lightning strike, used a cloud ring maker, built a bridge and lifted our body weight using pulleys – it is the ultimate way to teach your children about science. Even maths is fun here as we had to solve patterns and create puzzles – if only school was this much fun! There were a team of enthusiastic explainers (staff members) on hand to explain the science of how each exhibit works and they were very engaging with the children. One of the highlights was learning how to make the ultimate paper aeroplanes and helicopters which we tested over an air vent – Chloe and my husband enjoyed this so much I had to coax them away so we could see the shows which run throughout the day. The four different 20 minute live shows were brilliant and were worth the entrance fee alone. We watched the Flash! Bang! Wallop! show which was all about explosions and was fascinating for both kids and adults as the explainer was so much fun and really engaged with the audience. With lots of live loud explosions there were a few finger in the ear moments, we loved it and learnt so much about the science behind it – such as an explosion can put out another fire! It was so engaging especially as there is a lot of audience participation – Chloe was lucky enough to get involved and the look on her face as she held onto one of the experiments was brilliant. I loved how the girls were asking lots of questions such as what happens if I press this or why do you think this has happened – which shows they were really enjoying their time learning through play at Wonderlab. The best thing about being a child is being able to learn through the senses – sight, sound, smell and touch and Wonderlab offers exactly this! Chloe and Holly loved being able to touch, make, create and have fun especially when working out angles on the Water Jet Challenge. After spending over 2 hours here, (we could have spent most of the day at Wonderlab) we went to check out the rest of the museum. We also visited the latest exhibition at the museum – The Sun: Living with our Star which tells the story of Earth’s closest star, the Sun. As we walked through the yellow sun archway we entered a world of how the Sun is so important to us on Earth – it brings us light, heat and the seasons. This was a totally different experience to Wonderlab but it offered more opportunities for the kids (and us adults) to have fun through hands-on interactive experiences to watching a short film showcasing stunning imagery of the sun through multiple light filters. What was great for families was that the exhibition uses plenty of bite sized facts of how we have interacted with the sun throughout history. It was really interesting to see how historic objects were used, how the sun is used for healing and to the future with a focus on solar energy and nuclear fusion. We even came across a beach area where we sat on deckchairs and listened to beach sounds through coconut speakers. For the instagrammers out there don’t miss the yellow ‘sun beam’ which dissects the galleries, it was so much fun. After a busy morning we stopped for lunch at the really brightly coloured sun exhibition café on Level 2 which had some really cool seating. Better still their sun and space themed cakes were delicious. But this is just a small part of this amazing museum. 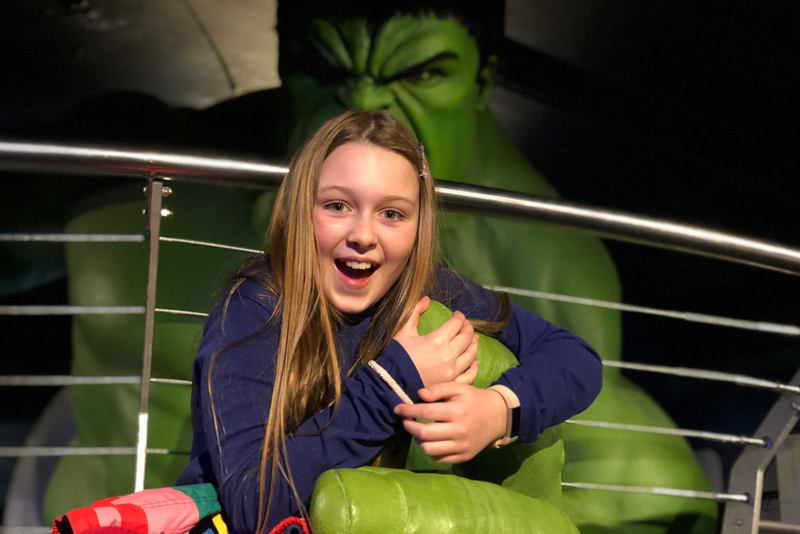 Over its five floors you can experience everything from seeing the actual Apollo space capsule or flying an aeroplane to immersing yourself watching one of the films at the giant IMAX theatre. There are over 15,000 exhibits in total in this amazing though-provoking museum. You could easily spend 2 days here and still not see everything. Tip – Use the map which is available from the ticket desk at the entrance. The Science Museum is huge, and with different floors and exhibitions it’s easy to lose your way. The energy hall is located in the central atrium of the ground floor and features a huge red mill engine and we learnt about the story of the power of steam. The historic full-sized engines on display were spectacular including those by James Watt the famous Scottish engineer. However Holly was eager to get to one of her favourite subjects ‘Space’ and the Exploring Space exhibition. Having recently watched the First Man movie I found the space exhibition fascinating. My husband and Holly are the real space buffs and could have spent hours here, with giant space rockets suspended above your heads, actual moon rock to a full sized replica of Eagle – the lander that took astronauts Armstrong and Aldrin to the moon. Exploring Space was fascinating – the only museum that could rival this in the country would be the National Space Centre in Leicester. Next up at the Making the Modern World gallery next door displayed 250 years of science and technology and some of our most iconic items that have shaped our society. Walking through this section we came across everything from planes, cars and trains to the capsule from the Apollo 10 mission. This circled the moon in 1969 before the Apollo 11 mission which the First Man movie is based upon. There was so much to see and do here and like the rest of the museum it was hard to know where to look – it is that good. We finished our visit at the tomorrow’s world section, and although Holly wanted to check out the IMAX theatre time was against us as we had a train to catch. There is so much to discover at the Science Museum and we merely scratched the surface of what is on offer here, which makes a return visit a certainty during our next visit to London. We left via the main museum shop which is packed full of cool science museum toys which provided perfect inspiration for the girls’ Christmas lists. The closest Tube station is South Kensington (Circle, District and Piccadilly lines) but we found High Street Kensington to be closer as you do not need to walk through the pedestrian tunnel – plus you will get to see the fabulous architecture of The Natural History Museum and its amazing seasonal ice rink.